From round pen, to arena and open trails we work for a calm, soft, straight and forward horse. Please take a look below at our philosophy to see how a horse purchased from us is trained. Top figure shows that beautiful headsets start with backend engaged and neck rising. Bottom shows backend dangling and nose out. Hitting that 4-beat gait square in the middle and gliding away on a soft rein. That’s the goal of our training program. To meet that goal, we use a variety of techniques from the movement to train and condition Rocky Mountain horses using Horsemanship. We take inspiration from the likes of Tom Dorrance, Ray Hunt, Bill Dorrance, Liz Graves, Lee Ziegler, Temple Grandin, Deb Bennett and Larry Whitesell. You won't find any double twisted wire bits, tie downs, chemicals or weights in our tack room. Instead, we work for a calm, balanced and forward horse that comes softly to the bridle. A beautiful headset starts with the hind feet engaging the backend as the loin coils and muscles deep in the base of the neck rise. Meet the horse where it is at. It’s real hard listening to folks talk about their horse being “naughty” or a “brat.” Horses are honest brokers and if they are troubled they tell you. We try to figure out where their minds are at and work from there. Don’t expect that they are going to figure out where our mind is at. The way to a horse's mind is through his feet. 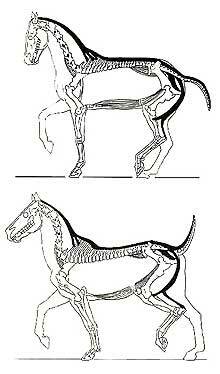 If a horse is troubled get their feet working - from the backend. Watch the mares work a herd - the one moving the feet is the one in charge. Communicate through feel, not conditioned cues. There is a subtle but very significant difference and that difference is at the core of Horsemanship. Rockies are so sensitive and smart that feel is a great way to communicate. Calm, supple (soft), straight, forward - This mantra is especially important with gaited horses. Of course, the quality of a gait is just as important with trotting horses but many people don't notice when a trotting horse is stiff. You will notice a stiff gaited horse that is trotting or pacing - ouch! 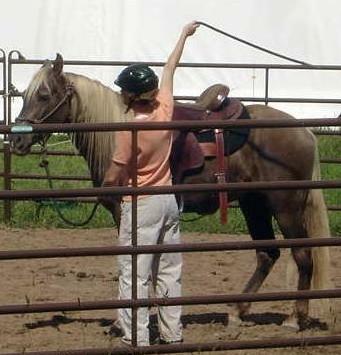 Rockies’ signature gait is the saddle rack which requires a lot of energy to execute. But energized doesn't mean reactive, stiff and crooked.